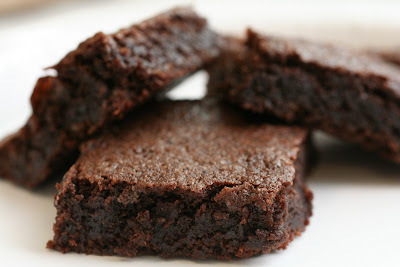 In celebration of National Brownie Day I'm posting a very basic recipe for Chocolate Brownies. This is recipe is sure to please the choco-holics in your life! Enjoy! Preheat the oven to 350 degrees. Loosely line a 13 x 9 inch baking pan with aluminum foil so that the foil extends two inches beyond each end of the pan. Lightly butter the foil. In a microwave-safe bowl, heat the butter and chocolates in a microwave set on High for one to three minutes, stirring halfway through cooking, until the chocolate is melted. Let stand at room temperature for ten minutes. In a large bowl, using a hand-held electric mixer, beat the eggs and sugars for three minutes or until light in color. Beat in the chocolate mixture and vanilla extract until blended. Mix in the flour and salt until just combined. Using a wooden spoon, stir in the nuts, if desired. Scrape the batter into the prepared baking pan. Bake for 28 to 33 minutes or until a cake tester inserted two inches from the center comes out almost clean. Do not overbake. Set the pan on a wire rack to cool. Store the completely cooled brownies in an airtight container at room temperature. These brownies freeze well. Makes about 20 brownies.